IRVING, Texas (April 27, 2016) - The National Football Foundation & College Hall of Fame (NFF) announced today the members of the 2016 NFF Hampshire Honor Society, which is comprised of college football players from all divisions of play who each maintained a cumulative 3.2 GPA or better throughout their college career. A total of 868 players from 275 schools qualified for membership as the society celebrates its 10th year, setting a new record for the number of players honored during the history of the program. The University of Dubuque is proud to have seven seniors from their 2015 undefeated Iowa Conference season (7-0) included in the 2016 class. Those honored include: Kyle Andresen (OL, Oxford Junction, Iowa/Wyoming HS), Tanner Bronkema (OL, Forreston, Ill./Forreston HS), Alexander Eckes (WR, Watertown, Wis./Occonomowoc HS), Zachary Marotta (DL, Wayne, Ill./South Elgin HS), Tyler Santeler (TE, Big Foot, Wis./Big Foot Union HS), Blaine Snitker (LB, Waukon, Iowa/Waukon HS), and Lucas Walzak (LS, Carroll Stream, Ill./Wheaton North HS). Five out of the eight Iowa Conference schools had student-athletes honored for a total of 30 honorees in 2016. The 868 players honored in 2016 is a new high water mark, eclipsing the previous record of 838 honorees in 2014. The initiative has honored 6,620 student-athletes since its inception, and the program has experienced growth every year in either members or school participation since its launch in 2007. The top five for total honorees during the 10-year span of the program include Brown (104), Dayton (89), Yale (81), Nebraska Wesleyan (79) and Johns Hopkins [Md.] (77). Union College (N.Y.) holds the mark for the most honorees in a single year, boasting 18 members in 2012. 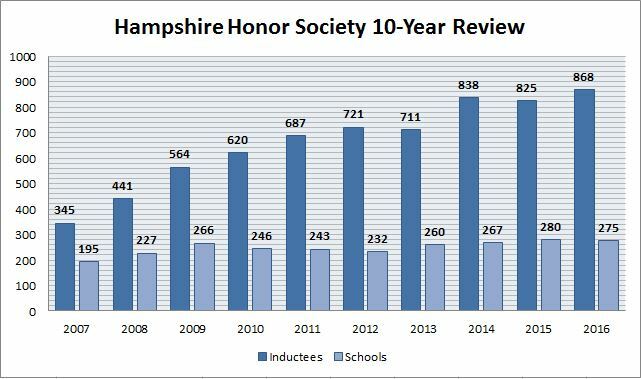 A total of 32 schools have had at least one student-athlete recognized in each of the Hampshire Honor Society's 10 years: Austin Peay State, Baylor, Brown, Bucknell, BYU, Colorado, Columbia, Dayton, Huntingdon (Ala.), Iowa, Johns Hopkins (Md. ), Kentucky, Lafayette, Minnesota, Minnesota Duluth, Montana, North Dakota, North Dakota State, Northern Iowa, Penn State, Purdue, Redlands (Calif.), Saint John's (Minn.), SMU, South Dakota State, Wartburg (Iowa), Washington U. in St. Louis (Mo. ), Wayne State (Mich.), West Virginia, Wingate (N.C.), Yale and Youngstown State. "We have honored more than 6,500 student-athletes in the last 10 years thanks to Jon Hanson's generosity," said NFF Chairman Archie Manning. "We are grateful for his passionate belief in the scholar-athlete ideal, and the Hampshire Honor Society allows us to showcase the names of tomorrow's leaders while inspiring future generations to follow in their footsteps."